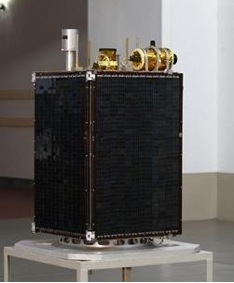 North Korea’s Kwangmyongsong satellites have progressed from a simple Chinese design launched in 1998, to a larger, more advanced version in 2009 and the latest model, the Kwangmyongsong-3 that it attempted to launch in April 2012. Since none of these satellites achieved orbit how they would perform remains just speculation. This article will assess the images and data that are available on all three of these satellites, including the Kwangmyongsong-3, which was shown to international media on April 8, 2012. Two main conclusions resulted from this analysis. First, the Kwangmyongsong-3 model provides important information that furthers our understanding of the DPRK’s program, but also appears to have been an engineering prototype since the actual satellite was likely already mounted on the Unha-3 satellite launch vehicle. Analysis of the media photos of the displayed satellite shows workmanship as would be expected of an engineering prototype, functionally like the flight version of Kwangmyongsong-3. However, no images were released of the installation of the actual satellite into the Unha-3, so this cannot be confirmed. Second, North Korea’s satellite program has progressed with each mission becoming more complex, but Pyongyang is constrained to the Kwangmyongsong-3 size, weight and shape, and to a low earth orbit because of the limitations of the current Unha launcher. A much larger space launch vehicle is in development that, if successful, will greatly expand the possible missions of the DPRK satellite program. The April 13, 2012 failure of the Unha-3 launch left many questions unanswered about the Kwangmyongsong-3. Figure 1 shows the Kwangmyongsong-3 as displayed to the media at the Sohae (Tongchang-ri) Satellite Center on April 8, 2012. Its stated missions were for earth observation and transmission of scientific data when orbiting over the DPRK, and to transmit the hymns of Kim Il Sung and Kim Jong Il the rest of the time. The earth observation mission included monitoring forest resources and natural disasters, assisting in food crop planting and forecasting weather, all of which could be accomplished to some degree with the low-resolution video camera reported on the satellite. In addition, the satellite probably had a command and telemetry system to allow it to perform the imaging and communications missions. The Kwangmyongsong-3 was designed to fly with its instruments and antennas pointed at the earth. It was stated it used 3-axis control, probably employing reaction wheels, so that its camera would continually point toward the earth. The solar panels once deployed and locked into place are not movable so they would only be in full sunlight for a portion of each orbit. The planned orbit was stated to be sun synchronous or polar with an inclination of somewhere between 90 to 99 degrees (not specified) at a circular 500 km altitude allowing the solar panel to charge the satellite’s batteries a portion of each orbit. The new DPRK satellite has similar features to its predecessor, the Kwangmyongsong-2, a communications satellite launched in 2009 by the Unha-2 that failed to reach orbit. While that satellite was never shown publicly, an artist’s concept has appeared in a video depicting a simulation of its injection into orbit from the Unha-2 third stage. (See Figure 2 for the Kwangmyongsong-2 satellite as it appeared in the simulation). Figure 2. Kwangmyongsong-2 seen in a simulation video dated 2009. 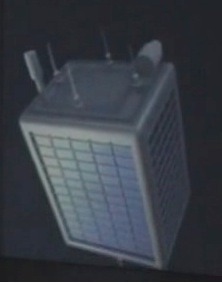 The similarities between the two satellites are as follows. Both appear to be the same shape (rectangular), size (approximately 0.75 x 0.75 x 1.1 meters) and weight (about 100 kgs). Both have nearly the same instrument placement and similar antennas. On the top of each are 4 UHF antennas for command, telemetry and communications missions. There are also two instruments, the vertical one possibly a Global Positioning System (GPS) antenna, the horizontally mounted one possibly an optical earth or sun sensor. 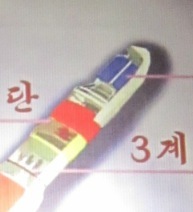 The Kwangmyongsong-2 has two additional UHF antennas on the bottom bracketing the adapter ring but those may have been removed from the Kwangmyongsong-3 so it could be displayed to the media. These antennas are probably to insure communications with the ground if the satellite is oriented with its other antennas pointing into space. In addition to transmitting hymns, the UHF system on the Kwangmyongsong-2 was planned to test relaying communications between different posts on the ground. This would have both civilian and military value. The Kwangmyongsong-3 was also intended to perform this mission with the same downlink frequency of 470 MHz. Figure 3 depicts the mounting of the Kwangmyongsong-2 satellite inside the Unha-2 shroud. Since the Kwangmyongsong-3 is the same size as its predecessor, and the Unha-3 shroud the same length and diameter and appears similar, it is likely that both were mounted in the same way. Figure 3. An enlargement of a poster at the Pyongyang Space Museum showing an artist’s concept of the Kwangmyongsong-2 satellite inside the Unha-2 shroud. Despite the similarities between the two satellites, the Kwangmyongsong-3 is more advanced than its predecessor. It has been equipped with a low-resolution video camera, an X-band down link needed to transmit the higher data rate video from the camera to the ground and a stated three-axis stabilization system needed to point the camera continuously at the earth. The opening for the lens and the X-band antenna are on top of the satellite near its center. The resolution of the camera remains unknown but is probably several 100 meters or greater, adequate for some civilian missions and of limited utility for the military, such as locating large fixed targets and conducting terrain studies. Finally, the Kwangmyongsong-3 has two fold out solar panels to provide more electricity for this imaging subsystem as well as a planned two-year mission. 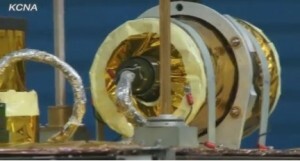 Figure 4 shows a close-up of an optical instrument on the Kwangmyongsong-3 that is possibly an earth or sun sensor. (Not shown is a black cap that covers the optical devise’s lens on the back of the instrument seen in Figure 1.) 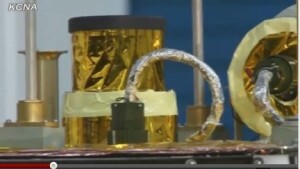 Two unusual features are the red grounding clips (the crimp style sold by Radio Shack) that connect the instrument to the satellite body and the masking like tape that surrounds the ends of the instrument holding the gold reflective covering in place. Also a bolt appears to be missing at the top of the instrument’s mounting bracket. The instrument is connected by a cable and plug to its electronics inside the satellite bus. In view of these very poor quality standards, the displayed satellite may be an engineering prototype, rather than the flight article. A close-up of the left top of the satellite shows the 10 cm video camera lens tube covered by a black lens cap (Figure 5). The camera located inside the satellite bus appears to be connected by a cable that comes up from the bus and is plugged into a connector on the bus. This seems to be very awkward. Also note what appears to be a tear in the cable covering near the top of the bus and masking tape that holds the gold reflective covering in place mid way up the lens tube. To the left and behind the lens tube is the X-band antenna, important because it was included in the DPRK’s required filings with the International Telecommunications Union (ITU), although no specific frequency was listed (X-band covers from 7 to 12 GHz). This would have been the DPRK’s first use of this frequency. Figure 6 shows an overview of the satellite’s top. 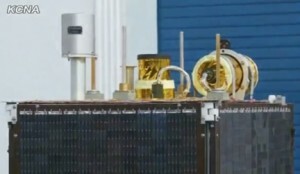 On the far left is an instrument that is possibly the GPS navigation antenna raised off the bus by a 14 cm tube and is a cylinder about 14 cm high and 10 cm in diameter. It is connected to the base of the tube by four screws and has what appears to be a black label with writing on its side. An instrument like this was also on Kwangmyongsong-2. Also note at the top front left and right corners of the satellite bus are hinges that attach to the solar panels along two of the sides. At the rear are clamps that hold the panels in place until they are released. Both the hinges and clamps are also on the bottom of the satellite. The panels move forward and lock into place after the satellite is released from the third stage. Since the back of the satellite was never seen in any media videos it is not known if it also has body mounted solar cells. Additional solar cells would increase the electrical power available to charge the satellite’s batteries and operate the same systems when the main panels are not facing the sun. Table 1 was compiled to compare the technical details of the three North Korean satellites and their launch vehicles. Several areas about their program stand out. For example, until today, rocket/satellite launches have occurred at an extremely slow pace, three in nearly 14 years, and none have achieved orbit. At this rate the next satellite launch attempt would be in 2015. However, given DPRK statements that it intends to launch many more satellites and the fact that it now has two operational launch facilities at Tonghae and Sohae, it is quite possible the pace will be stepped up in the future. Another trend of note is that each of the satellites has been progressively more advanced. Whereas the 1998 satellite was battery operated, the 2009 model had body mounted solar panels, and the most recent model had fold out solar panels to increase electrical power. Each new satellite has also added a new mission while retaining those of the earlier satellites, at first only intended to play the songs of its leaders, then to relay communications, and now to include a low-resolution imaging system. Technologically these satellites are still primitive. Moreover, the limitations of the Unha rocket mean that the North will probably not be able to launch more advanced satellites until a much larger rocket is available. Such a launcher appears under development. Despite these trends, predicting future developments in the DPRK satellite program remains difficult given numerous uncertainties such as whether the North succeeds in building larger launchers (the Sohae launch site was clearly constructed for such rockets as is the new pad at Tonghae currently under construction) or if it continues to develop satellites indigenously rather than securing external assistance. However, a good starting point is the May 7, 2009 press statement after the Kwangmyongsong-2 launch that stated, “Future plans include a more advanced communications relay or low resolution imaging earth resource or meteorological satellite.” The Kwangmyongsong-3 fits this description, but new generations of satellites may be intended not only for better imaging of earth resources, but also as cover for a military reconnaissance missions with resolutions in the 5 to 10m range. These would be comparable to French SPOT satellites that were used to provide unclassified imagery, such as aircraft on airfields and ships at naval bases, to allied forces in the first Gulf War. A larger rocket would enable Pyongyang to launch satellites of the 1,500 to 2,500kgs class into low earth orbits that would be more capable than Kwangmyongsong-3. With higher energy propellant 2nd and 3rd stages, the North could possibly send a small communications satellite into geosynchronous orbit, allowing for continuous, and more rapid communications than satellites in low earth orbits. NB: All dimensions and payload information are estimates. Kwangmyongsong translates to “Bright Star” or “Load Star” in English. A reaction wheel is a type of flywheel used primarily by spacecraft for attitude control and momentum in space. Pyongyang Korean Central Television via Satellite in Korean 1203 GMT 07 April 09. Pyongyang Democratic People’s Republic of Korea (Electronic Edition) in English 0935 GMT 05 May 09. DPRK’s launch notification to the ITU 20 March 2012.